Benelux consumers are living in highly-populated areas where living space is scarce. Consumers are critical about the products they are using and the space they take in their homes. 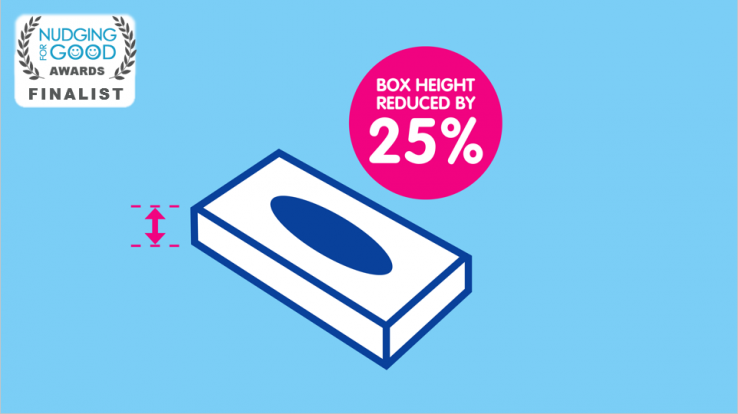 72% of the average tissue users don’t put the tissue box on the table because of the size of the box. Meanwhile shoppers are looking for value-for-money and the size impression of the product in store plays a key role. BACKGROUND: Using packaging technology to compress the Kleenex tissue box by 25%. PRINCIPLE: Reassure the consumer (anchoring) that the compact new tissue box offers the same quantity and Kleenex quality (setting a new category norm). Hard rollover from the old to the new box to frame the choice context towards the new compact box, creating a new buying and usage habit, while reassuring on value (justify price). EXECUTION: In the transition phase from the bigger box to the new compact box, communication focused on reassuring the consumer that the content of the box didn’t change but only the package changed to a more compact and convenient format.